A series by J. Klinkhardt, feat. Sezessions-Grotesk (before 1905), Sezessions-Kursiv and a halbfett. There are also licht (open, 1903), Kursiv halbfett (c. 1906) and fett (1909) styles. Cast under the same name by Bauer/Brendler/Flinsch, by Stephenson Blake (as Arabian , 1903), by Fondografica (as Como ), by Schriftguss (as Künstler-Grotesk, in breit, licht (before 1905) and schmal (before 1911) styles), and by Società Augusta (as Melpomene , 2 weights, before 1914) [Reichardt, Klimsch-Jahrbuch 1907]. 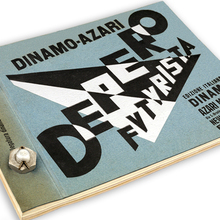 Reggiani had the halbfett as D’Annunzio [1937 specimen]. Reichardt further mentions that Arabian originated at Riegerl, Weißenborn & Co. Not to be confused with Sezessions-Grotesk (Ludwig & Mayer, before 1907) or Secession (Berthold, 1901). Text Gothic (ABC Types, 2004) is a loose digital interpretation in two weights.